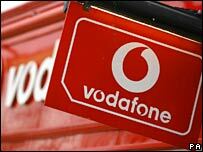 Mobile phone giant Vodafone has been fined 76m euros ($100m; £51m) by a Greek privacy watchdog. The Greek agency responsible for privacy said Vodafone had failed to protect its network from hackers who monitored 106 mobile accounts. The accounts targeted included those of Greek Prime Minister Costas Karamanlis as well as senior military officers and journalists. The illegal monitoring took place during the 2004 Athens Olympic Games. The family of a technician who died in mysterious circumstances after exposing a major phone-tapping scandal in Greece welcomed the decision to fine Vodafone. The technician's family believes the adjudication by Greece's privacy watchdog will boost its campaign to uncover the truth about the death. Costas Tsalikides, Vodafone's network planning manager in Greece, was found hanging not long after he informed his superiors that he had discovered spying software had been secretly installed in the company's system. Mr Tsalikides' family has always suspected that he was murdered by someone who strangled him and made it look like suicide. But a public prosecutor ruled out foul play and concluded that Mr Tsalikides had taken his own life. Vodafone has always fiercely rejected any connection between the scandal and Mr Tsalikides' death. Amid allegations of a cover-up, the parliamentary committee investigating the wire-tapping scandal closed down its inquiry because, it claimed, it could not determine who was responsible. Now the Tsalikides family campaign to get to the bottom of the mystery has been boosted by the adjudication by the Greek Communications Privacy Protection Agency. It ruled that Vodafone had obstructed its investigation, and for that single offence it handed out a fine of 15m euros in addition to a penalty of 503,000 euros for every one of the 106 VIP customers whose phones were bugged. The Watchdog also said it will question executives from Swedish telecoms group Ericsson to establish whether they had any involvement in the scandal. The Tsalikides family lawyer, Themis Sofos, told BBC News he was very happy with the ruling because it proved that vital evidence had been hidden. Vodafone is planning an appeal after describing the punishment as "illegal, unfair and totally groundless". Many Greeks believe that the bugging of the prime minister, other politicians and senior military officers was carried out at the behest of the United States because it was concerned about security at the 2004 Athens Olympics.